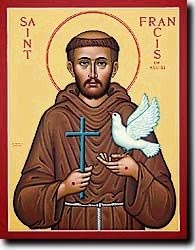 St Francis of Assisi was a man of action, impetuous and impulsive and totally committed to the Lord Jesus. The song below with lyrics by Donovan is meant to be a reflection on the life of Francis. It talks of simplicity and heartfelt service for the Lord. However Francis' great achievements in preaching and teaching were gained at a rapid pace before he died at the early age of 45. The slow pace of the song seem at odds with that. Nevertheless I like the idea in this song of taking care day by day of the small things and remembering the ultimate goal. Do few things but do them well.